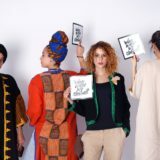 Published on Moroccanladies.com in 2015. 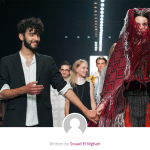 Only 20 years old, yet Morocco’s Hamza Guelmouss has started making a name for himself as the fashion designer to watch. 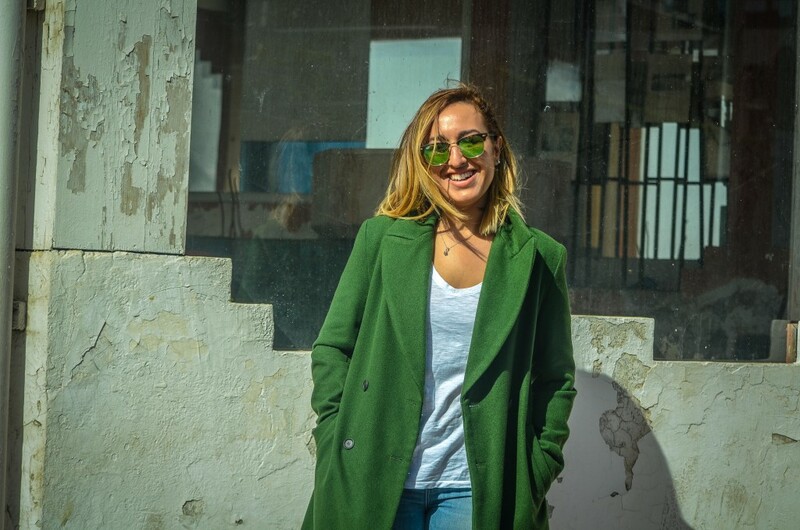 The only Moroccan finalist at the Elle Rising star contest, the young artist is one more example of perseverance and the talents our country holds. To ease our curiosity, we had a little chat with Hamza Guelmouss to get to know more about this “Moroccan rising star”, and here is what he had to say. 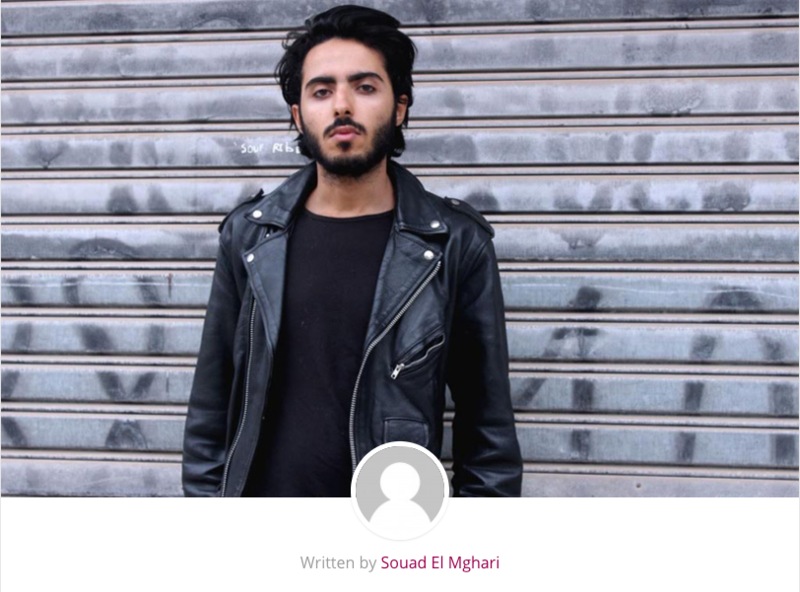 You describe your own aesthetic on your blog (summer redemption) as dark, is Hamza a dark person? I’m a quite moody person, I find beauty in strange things (Strange for others); it could be an old slaughterhouse, or the way people look when they are ill; or simply something that people neglect for years. I mean my first collection was inspired by a post apocalyptic movie; so for me it’s a normal thing, that doesn’t mean that I am a freak just because I like black, people usually find me to be very funny. So I would say dark is more my aesthetic than my personality. Who is the woman you are generally designing for? I’m designing for an edgy and young woman who likes to dress mostly in black and is slightly drawn to a more avant-garde and underground feel. Conforming to trends is not her thing. She’s a Rock’n’Roll Tomboy who loves to layer clothes, and who is aware of who she is, what she wants and doesn’t give a s***! What fashion era would you say influenced you the most? I always have been very influenced and touched by the anti-fashion movement that came out to Paris and London in the late 80’s and 90’s, with the emergent Japanese designers as Yohji Yamamoto and Rei kawakubo, and also the Antwerp Six in Belgium who played a very big role in fashion at the time, and who had a huge impact on my aesthetic as a designer. Who would be the designer(s) you look up to? Rick owens, Ann Demelemeester and Yohji Yamamoto; these are my hereos. If you would take a muse (like a Kate Moss or a Naomi Campbell, on anyone else) who would it be? I have a lot of muses, I mean my very first muse was my best friend, but I would say Kristen Mcmenammy, Michelle Lamy and Kate lanphear; these are the women who inspired me through the whole process of my work. You are such a young designer; both in age and career, how do you see your future in the industry? Yeah I am; and I came to the conclusion lately that I want to build a brand and shake things up a little bit. I am also looking to grow as a designer and are willing to learn in order to create better: So yeah, I want a future in the industry, because you can never learn enough. I read that you used to steal your father’s clothes and collect second-hand clothing, how did that influence your sense of fashion? I grew up in a typical Moroccan environment which doesn’t really give that much importance to individuality and people; kind of all looked the same. And to be honest I was in high school and couldn’t afford what I wanted to wear every time I went to a store, then I kind of discovered my dad’s knitwear and blazers, and found out about souks and popular thrift stores; so I started ripping my jeans and layering my father’s XXL blazers and sweaters with original pieces that I bought for like 30DH at those thrift shops and souks. I sure looked huge, but I was very comfy and confident and it influenced a lot of my fashion sense, because I then learned how to balance proportions at a very young age. My own personal style is a mixture of grungy pieces; androgynous ones; such as long tunics and dresses, and lots and lots of chunky silver jewellery. I usually only dress up in black, but I might have a little pop of color; like a dark blue or blood red sometimes. This might sound impossible, but if I asked you to describe your collection for the Elle Rising Star in one word, what would it be? 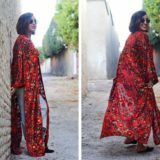 Would you say that you being a Moroccan influenced your fashion or aesthetic in some way? If yes, how? I wouldn’t t really say that Morocco as a heritage influenced my fashion aesthetic, but being a Moroccan who only had a small access to fashion and art made me a very curious and an outraged person; because what you can call my own fashion revolution came from the fact that I was fed up with the whole traditional bling bing lifestyle that exists in our culture, and I’m grateful to my country for that.